Coretec Plus is a luxury vinyl that looks like hardwood, but it's waterproof. Unlike laminates (and engineered hardwood), Coretec Plus is 100% waterproof. And, in my opinion, it looks way more real than laminate and even better than engineered hardwood. Coretec Plus has 3 layers. 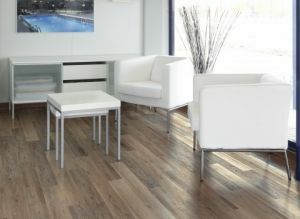 The luxury vinyl is on top (and comes in many colors), with a recycled limestone core and an attached cork underlayment. All 3 layers are waterproof. It comes in a variety of colors from light to dark, as well as grays and white washes. There are both rustic and contemporary colors and textures. Coretec Plus comes in individual planks that are clicked together. The planks are 8 mm thick. You can read my full review of Coretec Plus here.